What Gucci showed on the runway was completely amazing! The clothes had all something romantic with deep colors such as emerald green. The whole collection reminded on a mystic story in the forest. Some accessories were definitively striking – the big glasses often combined with crochet caps made the whole collection to an absolute new thing we haven’t known from Gucci yet. But I think we love this new style already now – more please! Another great collection was shown by the one and only Emilio Pucci. The fabrics of all the clothes looked extremely light and comfortable. In every look there was something about sea motifs or colors that reminded on the underwater world. One thing we should definitively keep in mind is the dress over the sweater combo. It has already been showed by other designers several times during these Fashion Weeks. So, also in Pucci we could see some models who wore this amazing match. As the similar sounding brand Gucci, Emilio Pucci also showed these big glasses. In addition to all the great clothes the creative director Massimo Giorgetti often combined some terrific feathered shoes. I really don’t know how he does it. But Jeremy Scott manages it to fascinate with a really freaky and fancy collection every season. This time the main topic was construction. The catwalk looked like a building lot. It started when the first model came out walking down the ‘street’ wearing an outfit that reminded on a road worker. In the middle, everything went dark and a carwash was set into action. Then, the models walked the runway again – or they danced on it – with soap bubbles around them. The whole fashion show wasn’t just about showing the new Moschino collection – it really was about making a show! Even though it was quite freaked out Moschino showed some real haute couture and extremely elaborated clothes. When you think about Milan and fashion what is one of the first things that comes into your mind? Well, I’m sure many of you relate Prada to the big fashion city – this is also very eligible. 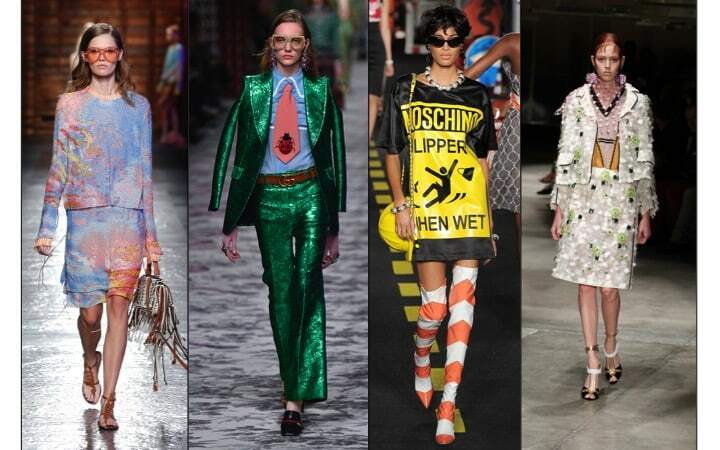 Yesterday, Miuccia Prada proved that she’s one of the best designers who made her way from Milan to all over the world. With her newest collection it seemed like she wanted represent a confident woman. The clothes had straight cuts and strong lines. In some looks there were some flowers added who gave the outfit a more feminine touch. For colors Prada showed a create palette of grey, red and black but there were also brighter tones such as light green, pale yellow and white. Posted in Inspiration and tagged Accessories, Beauty, Blog, Classics, Emilio Pucci, Fall, Fashionblog, Fashionweek, Glasses, Gucci, Inspiration, Italy, Jewels, Make-up, MFW, MFW SS16, Milan, Moschino, New Collection, Prada, Spring Summer 2016, Trend. Bookmark the permalink.